Subrogation lawsuits by insurance companies are a common occurrence in Florida car accident cases. 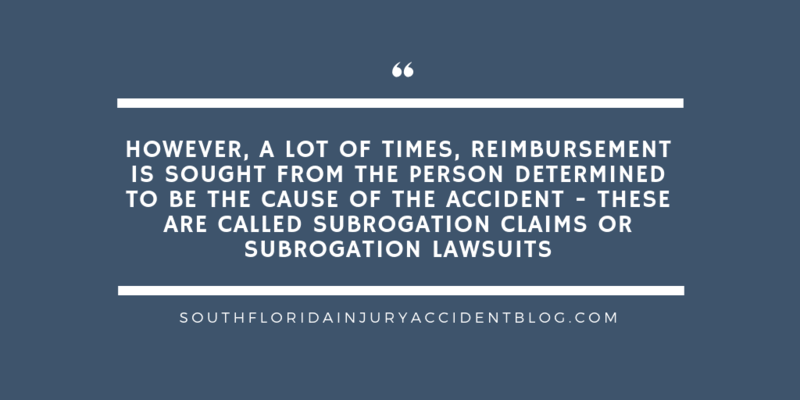 Subrogation is when an insurance company seeks reimbursement from the party that caused a car accident for the money it has to pay to its insured for a claim. The most common subrogation lawsuits relate to property damage claims (i.e. the cost to repair or replace a car) but they also include personal injury claims. What Happens When A Subrogation Lawsuit Is Filed? A subrogation lawsuit is filed just like any other lawsuit in the State of Florida. A complaint is usually filed in the county where the defendant resides and he or she is served with the lawsuit by a process server. Once the defendant is served, he or she will need to file an answer within 20 days of being served or risk a “default judgment” being entered against him or her. In the subrogation lawsuit, the plaintiff will be named as “Named Insurance Company a/s/o accident victim” versus “Other Driver”. The complaint will explain that the insurance company plaintiff “became subrogated” to the rights of its insured against the defendant. Which Insurance Companies Are Involved After a Motor Vehicle Accident in Florida? In Florida, any number of insurance policies may provide financial assistance through insurance coverage after a car accident. Personal Injury Protection (PIP) Insurance, which is mandatory under Florida law, covers you – regardless of fault (i.e. whether or not you cause the crash) – up to the limits of your policy (the minimum in Florida is $10,000.00). There’s also Underinsured/Uninsured Motorist coverage (UM) which pays medical expenses, lost wages and related damages if a driver is in a car accident caused by a driver who does not have liability insurance. The victim’s health insurance, through the victim’s employer or the victim’s own policy, may cover some of the medical expenses, including ambulance services, surgery and physical therapy. If there is no health insurance policy, then Medicare or Medicaid may cover some of the medical expenses. There are two kinds of damage claims after a car accident. After someone is in a crash, they may have to deal with physical injuries suffered in the accident as well as replacing or repairing their vehicle and other property that was impacted by the collision. In a severe accident, for example, the accident victim may spend time in the hospital recovering from fractures or concussions while their SUV has been towed to a lot somewhere, undriveable. Under an insurance contract, the two different types of claims are referred to as: (1) bodily injury claims and (2) property damage claims. Bodily injury includes any kind of physical harm suffered in the crash, as well as emotional or psychological trauma that resulted from it. Medical expenses, including any surgeries or physical therapy, are part of a bodily injury claim. Pain and suffering is also considered part of a bodily injury claim, alongside lost wages, lost future earning capacity, etc. Property damage after a motor vehicle accident involves the vehicle itself, of course, but also any of property that was harmed, as well. Things like the victim’s iPad or laptop, their smartphone, and any other valuables (watch, jewelry, etc.) can add up to a significant property damage claim independent of any physical injuries you suffered. Because insurance companies know they will have to pay property damage claims and bodily injury compensation to their insured, the accident victim’s insurance companies have reserved certain rights in their policies. An insurance policy is an agreement between the company and its insured or policy holder in which the parties agree that the carrier can proceed to seek reimbursement from the at-fault party for money it has to pay to its insured after a car accident. In industry terms, the accident victim’s insurer is subrogated to the rights contained in the insurance policy and can step into the policyholder’s shoes to try and get reimbursed either by settlement negotiations or by filing a lawsuit against the at-fault driver (and his insurance carrier). In most automobile accidents, the vehicle suffers some type of damage. Sometimes, the insurance adjuster may determine that the car is “totalled.” A totalled car is one where the cost to repair it is more than the cost to replace it. The insurance company is obligated to cover this type of claim and pay the insured the agreed amount of coverage (replacement value or the fair market value of the car – check your policy). If there were personal property items inside the vehicle at the time of the crash, they can be covered as well under the property damage provisions of the policy. Thereafter, the insurance will ask its insured, to sign the necessary paperwork (“subrogation release”) so it can move forward on getting that payment reimbursed by those responsible for the accident. Next, the innocent victim’s insurance company will demand, and if necessary file a lawsuit, against the at-fault driver for the money that it paid to get its policyholder’s car fixed or replaced, along with the repair or replacement of the damaged personal property. After the victim signs the paperwork, the insurance company seeks subrogation from the driver who was at fault in the accident. If a lawsuit is filed, the insurance company will be named plaintiff, not the policyholder whose car was totaled. Subrogation provisions in health insurance policies are more complex for bodily injury claims. Just like property damage claims, they may allow the innocent victim’s carrier to go after the at-fault driver (and his insurance company) for reimbursement of the medical expenses and health care costs that were paid on behalf of the innocent victim. However, they may also seek reimbursement against any other medical insurance policies that cover the innocent victim if those policies provide coverage for the accident injuries. There is a car crash in Miami. The accident victim has health insurance with his employer. The victim is hurt in the crash and the medical bills total $20,000.00. The company health insurance covers the full amount of $20,000.00 in medical expenses. Then, the health insurance company seeks subrogation from the at-fault driver and his insurance carrier for the full $20,000 it has paid out in the victim’s medical expenses. What if the driver has no insurance? It is possible for an insurance company to file a subrogation lawsuit against the uninsured motorist. However, these are often called “judgment proof drivers” because they likely do not have the funds to cover the reimbursement claim. Aggressive insurance carriers may nevertheless file these uninsured motorist subrogation actions. They may try and negotiate payment plans in settlement given the uninsured driver’s financial condition. One defense to a subrogation lawsuit is that the policy does not allow it. Contract law may determine that the carrier does not have a right to subrogate under the terms of the insurance policy. Another defense is the “subragor” was not innocent. Here, the insured accident victim is either the sole cause or contributing cause of the accident. Thus, the insurance carrier either has no right to recovery or to recover an amount that is “diminished in proportion” to the percentage of cause attributed to their policyholder. For more on fault, read: Does Fault Impact Damages in a Florida Car Crash? Failure to mitigate bodily injury damages is another subrogation defense. In this case, the argument is that the claims paid could have been lower if the innocent victim or the carrier had tried to keep the costs down. Having admissible evidence of reasonable and necessary medical costs may be challenged as lacking in the subrogation claim. For more on medical expenses, see: How Do I Pay My Medical Bills After a Florida Car Crash? Failure to provide proper evidence of the alleged property damages is another subrogation defense. Here, the argument is that the claims were paid, but the reimbursement claim fails to provide any reasonable basis for the “loss in value” asserted for the vehicle and its contents. After a serious car accident, it’s difficult enough to recover from your injuries and the aftermath of being in the crash. So, being involved in a subrogation lawsuit is the last thing a car accident victim needs at a time like this. Usually, these subrogation claims take place between the insurance companies and drivers are copied with correspondence and status updates as things progress. However, subrogation lawsuits do get filed against individuals after there has been a motor vehicle accident here in Florida. An experienced Florida personal injury lawyer can help you understand what subrogation involves in your circumstances, and what you can expect in any lawsuit that may be filed seeking reimbursement of paid claims by an insurance carrier after your accident. A good piece of advice if you are being sued by an insurance company related to a car accident is to speak with an experienced personal injury lawyer to learn about some of the issues that can arise with these claims, including the type of evidence needed to prove a claim and the type and amount of damages you can recover. Most personal injury lawyers, like Alan Sackrin, will offer a free initial consultation (over the phone or in person, whichever you prefer) to answer your questions. Do You Have to Pay Back Your Insurance Company After an Accident Claim?